Yunifasiti Harvard je yunifasiti aladani ni ilu Cambridge ni Ipinle Massachusetts ni Amerika. ↑ An appropriation of £400 toward a "school or college" was voted on October 28, 1636 (OS), at a meeting which initially convened on September 8 and was adjourned to October 28. Some sources consider October 28, 1636 (OS) (November 7, 1636 NS) to be the date of founding. In 1936, Harvard's multi-day tercentenary celebration considered September 18 to be the 300-year anniversary of the founding. (The bicentennial was celebrated on September 8, 1836, apparently ignoring the calendar change; and the tercentenary celebration began by opening a package sealed by Josiah Quincy at the bicentennial). Sources: meeting dates, Quincy, Josiah (1860). 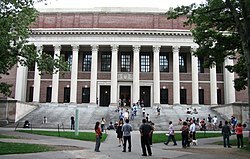 History of Harvard University. 117 Washington Street, Boston: Crosby, Nichols, Lee and Co.. , p. 586, "At a Court holden September 8th, 1636 and continued by adjournment to the 28th of the 8th month (October, 1636)... the Court agreed to give £400 towards a School or College, whereof £200 to be paid next year...." Tercentenary dates: "Cambridge Birthday". Time Magazine. 1936-09-28. Archived from the original on 2012-12-05. Retrieved 2006-09-08. : "Harvard claims birth on the day the Massachusetts Great and General Court convened to authorize its founding. This was Sept. 8, 1937 under the Julian calendar. Allowing for the ten-day advance of the Gregorian calendar, Tercentenary officials arrived at Sept. 18 as the date for the third and last big Day of the celebration;" "on Oct. 28, 1636 ... £400 for that 'school or college' [was voted by] the Great and General Court of the Massachusetts Bay Colony." Bicentennial date: Marvin Hightower (2003-09-02). "Harvard Gazette: This Month in Harvard History". Harvard University. Retrieved 2006-09-15. , "Sept. 8, 1836 - Some 1,100 to 1,300 alumni flock to Harvard's Bicentennial, at which a professional choir premieres "Fair Harvard." ... guest speaker Josiah Quincy Jr., Class of 1821, makes a motion, unanimously adopted, 'that this assembly of the Alumni be adjourned to meet at this place on the 8th of September, 1936.'" Tercentary opening of Quincy's sealed package: The New York Times, September 9, 1936, p. 24, "Package Sealed in 1836 Opened at Harvard. It Held Letters Written at Bicentenary": "September 8th, 1936: As the first formal function in the celebration of Harvard's tercentenary, the Harvard Alumni Association witnessed the opening by President Conant of the 'mysterious' package sealed by President Josiah Quincy at the Harvard bicentennial in 1836." ↑ Hechinger, John (September 11, 2009). "Harvard, Yale Are Big Losers in 'The Game' of Investing". The Wall Street Journal: p. A1. http://online.wsj.com/article/SB125261209050800581.html#mod=todays_us_page_one. Retrieved September 11, 2009. Àtunṣe ojúewé yi gbẹ̀yìn wáyé ni ọjọ́ 26 Oṣù Kẹjọ 2014, ni ago 02:24.